Do You Have Concerns About Home Floor Replacement? When it comes to taking care of the house, many homeowners take the job very seriously. And rightfully so! It’s important to make sure your living space is both safe and comfortable for you and your family. Most people are interested in making sure their homes are visually appealing. After all, many individuals spend a lot of time at home and entertain guests from time to time. So, having everything in its proper place is a big part of making the home both welcoming and beautiful. One of the things that you should keep in mind while working on the appearance and overall feel of your home is the flooring. Speaking of the floors, do you think it’s time to give your flooring a makeover? Not sure if a floor replacement job is in order? Let us help you figure it out! Is It Really Time for Floor Replacement? Believe it or not, there are a lot of reasons to replace your flooring. Floor replacement is a big job. But it’s something that has to be done every once in a while. Still, a lot of people aren’t quite sure if or when they need to let go of the old to make space for the new when it comes to the flooring. It’s not always easy to know if it’s time to invest in something new in your home. Whether it’s time to buy a new couch, upgrade the washing machine or, well, get a floor replacement job, many homeowners find themselves wondering if they should do it now or later. But, while you might be able to fix the washing machine or reupholster the couch, the flooring is a bit of a different story. Not to worry, though. Honestly, replacing the flooring in your house could be one of the best decisions you’ve can make for your home. Alright, so now that you’re seriously thinking about floor replacement, we’ll respond to a few of the concerns you might have right now. #1. I’m planning to sell move out soon. Should I really waste money on the floor when I could use it for other upgrades? Honestly, no one wants to have to replace the flooring as soon as they move into a new home. They may want a new refrigerator or a fresh coat of paint in the guest bathroom. But, getting new flooring could delay them from moving right into the house. So, installing new floors as the current homeowner, it might actually benefit you and your potential buyers. #2. I want to get hardwood but it’s not quite in my price range. Maybe I should just stick with the flooring I’ve got. With laminate, you can actually get the “wood look” without spending as much cash. If your current flooring is worn, old, or cracked, why settle for it? Floor replacement doesn’t have to be as expensive as you think. And you can choose a new flooring option that will make the process worth it! #3. I have kids and pets. If I replace the flooring, it could get ruined. Durability. It’s what you should look for in new flooring. You can find flooring that is child and pet-friendly while still giving off the appearance you want in your home. Ready For Your Floor Replacement Project? So, do you think it’s time to look into getting new flooring in your home? If so, Let DustBusters Floor Removal help you! 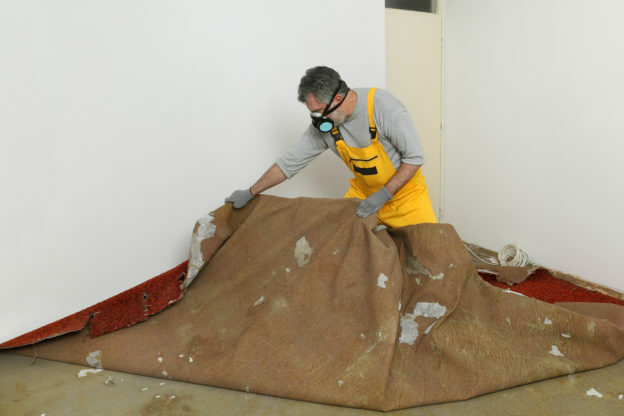 We can quickly get rid of the old floors without leaving a trace behind. Then, you can finally get the flooring that you want in your house! Contact us today to request an appointment!